1. What first sparked your interest in textiles? My mother and grandmother were custom dressmakers, and I have been sewing for a long time. When I first came to Japan, I discovered Japan’s long history of superb textile-patterning techniques. I decided to study yūzen (resist dyeing) and other traditional textile dyeing. 2. You were a costume designer for over a decade. What costumes were the most interesting? Among other groups, I designed costumes for Tokyo Theatre for Children. Adult actors needed to be animals or quirky, fun remakes of traditional fairy tale characters. I enjoyed the challenge of creating animal costumes that were not realistic, yet instantly recognizable. I also enjoyed doing creative versions of fairly tale classics, like costumes for the ugly stepsisters in drag. 3. 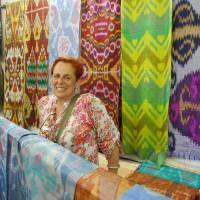 Now you sell your handmade, repurposed-textile products online. Have you learned any entrepreneurial lessons? Be honest and fair. Do not expect to make money, it’s very hard. But it is very satisfying if you like to create and love what you do. 4. What’s the most challenging aspect of repurposing textiles? It’s often hard to tell about the quality of an old textile. Some I buy are not suitable once I look at them closely at home. They can be weak or have damage. It almost breaks my heart to see a badly damaged piece of something gorgeous that had been the pride of someone’s kimono collection or that some artisans had spent many hours decorating with embroidery, weaving or dyeing. 5. Where do you source your textiles? In Japan I visit flea markets or buy online. New fabrics come from (stores in) Nippori in Tokyo. 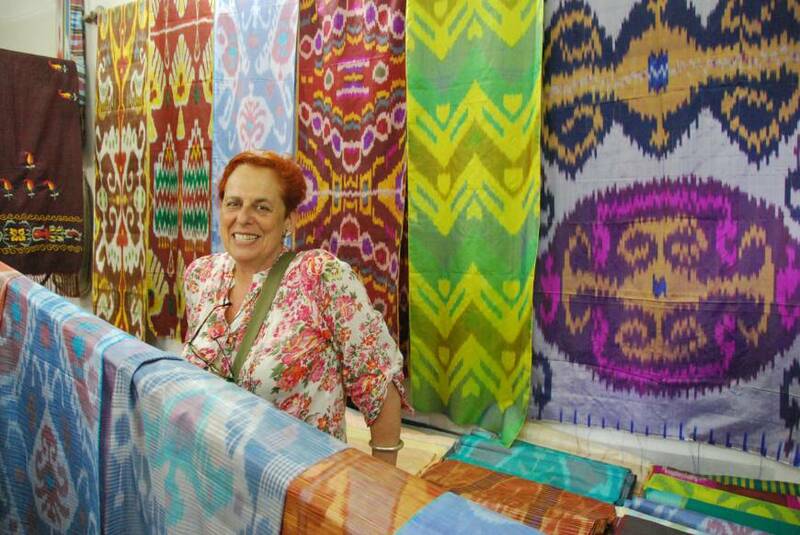 I also love to travel in Asia and always look for textiles. 6. What’s the most unusual use of vintage textiles you’ve seen? I saw a lovely outdoor wedding at a harborside park in Sydney where the bride wore a traditional white wedding dress with a decorative belt made from an obi that trailed down the back. I also enjoy the current fashion of using sashiko quilt stitching to repair vintage jeans. 7. What’s your favorite type of fabric to work with? Cotton is easy, though silk is beautiful. Silk has a sheen and a great feel. 8. What advice would you offer to someone attempting their own repurposing project? Just try it. The more you try, likely you are to achieve. It takes practice. 9. Which contemporary Japanese designers do you admire? I’ve seen so much great design in clothing, shops, products, interiors and buildings. When I first moved here, it was in the middle of the ’80s Japanese fashion boom. So I loved what Japanese designers were doing, like Issey Miyake, Kansai Yamamoto, Rei Kawakubo, Yohji Yamamoto. Now I’m really inspired by Japanese architects like Toyo Ito and Shigeru Ban. 10. How do architecture and textiles intersect? The study of architecture gives you a broad design education, which enables you to evaluate and apply design principles to almost anything. Function and materials may vary, but the basic understanding of analysis and performance requirements are similar. 11. Do you have any guilty pleasures? I don’t feel guilty about any of my many pleasures! 12. Name a Japanese custom that you think should be exported and why? Shoes at the door keeps houses clean. And Japan’s gift-giving and wrapping culture shows that you’ve thought about others, and care. 13. What do you have too many of? Fabrics of course! And yet when I try to match fabrics together for a bag, for example, I never seem to have quite the perfect match. Also, baskets and containers. 14. What’s your favorite Japanese movie? Ghibli movies. My kids grew up in Japan, so they loved them. The movies have superb animation and touch on basic truths. 15. What do you always have in your fridge? Hot sauce and pickles. 16. Do you have a favorite Japanese word or phrase? Zen-zen dame! (“Not at all possible, don’t even think about it.”) I like the absolute negative of the phrase, and it sounds good. 17. What first impressions do people have of you? I’ve been a “natural” redhead for about 30 years. That’s probably the first thing people notice about me. 18. Who populates the deepest circle of hell? Bureaucrats. 19. If you had a motto, what would it be? Live well, look for beauty. 20. What is your best tip for surviving summer in Japan? Leave! I’ve known a number of women who turn on the AC and knit or sew in the hot season. Having an indoor hobby certainly helps.